353 species of birds have been recorded in Polk County, many of which have been extraordinary sightings. 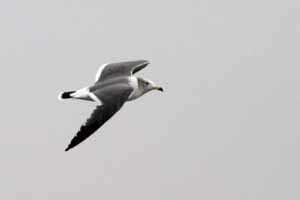 This Black-tailed Gull which appeared at Saylorville Reservoir in November 2007 is just one example. Habitat ranges from the city of Des Moines where Peregrine Falcons have successfully been reintroduced on tall buildings to wooded corridors along the Des Moines and Raccoon rivers to broad expanses of grasslands and row crops. Saylorville Reservoir on the Des Moines River north of the city offers interesting birding, especially in the spring, fall and winter, with it's myriad of water-related species as well as northern winter visitors. Be sure to read our Birding By Month feature for more detail on things to see in these areas. Our map of birding locations around the area may help you find some great birding areas. Birders will also want a copy of The Makoke Trail - a Guide to Birding in Central Iowa. This beautifully illustrated guide gives many more details of what to expect and where to go. Generally birds of the Des Moines area have an eastern flavor although we are also on the eastern edge of some western species. 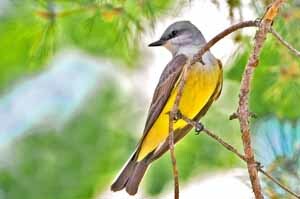 For a number of years now Western Kingbirds have nested in the metro area, most notably aroung the statecapitol complex. For a Polk County checklist visit the County Checklist page on the Iowa Ornithologists' Union site.